This highway connects the Inside Passage community of Haines with Haines Junction in the Yukon Territory. 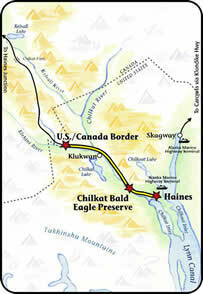 First used by the Chilkat Indians, the highway became a packhorse trail to the Klondike goldfields in the late 1880's. In 1943, the U.S. Army used the highway as a military access road during World War II. This byway is encompassed by the lush coastal rain forest as it makes its way up the St. Elias Mountains and into Canada where the forest gives way to alpine tundra and the Haines Highway connects with the Alaska Highway at Haines Junction. 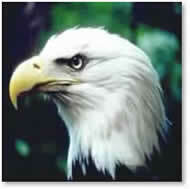 Established in 1982, the Alaska Chilkat Bald Eagle Preserve is seasonal home to 3,000 bald eagles. They are attracted by fall and winter runs of salmon in the Chilkat River. It is common to view hundreds of these regal birds roosting in the cottonwoods along the Haines Highway between October and January. Watch for fish wheels being used on the Chilkat River in June. To the west is Canada's Tatshenshini-Alsek Wilderness Park, home to grizzlies, Dall sheep, rare glacier bears and birds. Bald eagles gather in trees at the council grounds in the Bald Eagle Preserve on the Haines Highway. View of Haines and Lynn Canal from Mt. Ripinsky in the summer.